Our story is one of family. Frank “The Chief” Corrigan came to Dearborn, Michigan, in 1923, lured by the $5 daily salary promised by Ford Motor Company. At Ford, Frank worked nights on the Ford farms performing a variety of jobs. Sometimes he even chauffeured Henry Ford himself. The Chief was ambitious, and during the day when he wasn’t working at Ford he ran an ice delivery service with his brother. When the Great Depression hit, Frank used his trucks to help families forced from their homes relocate their belongings. Paul proved to be a gifted business leader, and under his guidance Corrigan began to grow and expand. In 1949, Corrigan joined United Van Lines because the idea of being part of an agency-owned van line appealed to Paul. The agent-owned structure gives agents like Corrigan control over the direction of the van line. 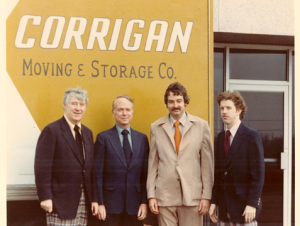 Over the next four decades, the Corrigan family expanded along with the business. Paul married Kathleen O’Hehir in 1954 and together they raised six children. As they grew up, all six of the children worked at Corrigan in some regard, either on the trucks or in the office. Corrigan expanded for the first time in 1969 when it opened its second office in Ann Arbor, Michigan. Corrigan operated as a two-office business for the next 15 years. In 1984, it began a relatively rapid eight-year expansion and acquisition phase, when new branches were opened in Auburn Hills, Toledo, Flint, Bay City and Grand Rapids. In 1987, Corrigan purchased a new 87,000 square-foot warehouse and office facility in Farmington Hills and relocated their headquarters from the Dearborn office into the new facility. 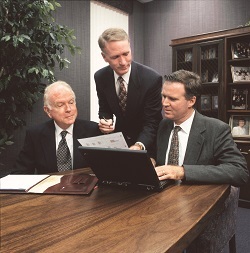 In 1995, Paul’s sons took over the top positions in the company. David was named President and COO, and Michael was promoted to Executive Vice President. Paul Corrigan became Chairman of the Corrigan Board and CEO, and to this day remains actively involved. Corrigan Moving Systems has always been open to expansion opportunities that will help the company increase its quality and service reach. Two excellent opportunities presented themselves to David Corrigan, and so, in 2003, an office was opened in Rochester, New York, and, in 2006, the newest office was opened in Chicago. These were the first Corrigan offices in both of these states. As Corrigan has grown, it has also expanded service offerings. 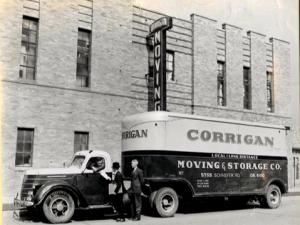 A long way from hauling ice, Corrigan now handles a wide range of household goods relocations. Corrigan has also branched out into record storage, commercial and office relocations, systems furniture assembly and disassembly, logistics management and international freight forwarding. Today, the Corrigan team continues to uphold Frank’s founding code of ethics, and thanks to that, has grown into one of the most respected moving companies in the nation. The Corrigan family has grown tremendously over the years. In addition to Paul Corrigan’s six children, he now has 19 grandchildren, and 14 great-grandchildren. The fourth generation of Corrigan’s has now joined the family business, as three of David’s children are working full time at Corrigan Moving Systems.